One of the standouts in the 1980’s when it came to high powered melodic progressive metal is Queensrÿche. This Seattle-based quintet made their mark through multi-octave vocals and catchy musical hooks with that degree of intelligence and sophistication to make them superstars from the underground to the mainstream at their own pace. 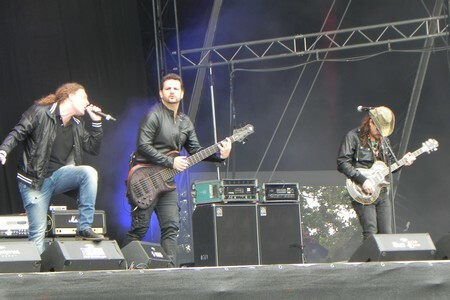 Creating a discography that remains relevant today from one of the best concept albums in metal for Operation: Mindcrime on through to unforgettable anthems such as “Queen of the Reich”, “Take Hold of the Flame”, and “Jet City Woman” beyond their top ten single “Silent Lucidity” – the band has been through obvious bumps in the road over the past decade or so resulting in a split between vocalist Geoff Tate and the rest of the group. 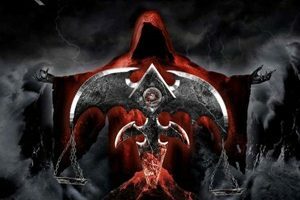 Now with Todd La Torre firmly in the vocal slot, The Verdict is an album that could capture not only the old guard of Queensrÿche followers, but hopefully bring some younger people into the wonders of this masterful act. Ready to discuss their career, challenges, and successful times is guitarist Michael Wilton – a thoughtful and insightful musician who as you’ll read, still has genuine enthusiasm this deep into his career, which is a rarity after 37 years in the group. Dead Rhetoric: The Verdict is the 14th studio album for the band. Can you tell us a bit about the recording and songwriting process for this one- and how you see it stacking up in terms of the discography now that this is the third record with Todd on vocals? Michael Wilton: Right. 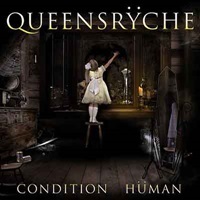 This version of Queensrÿche has been solid for seven years – and we are very happy with it. We’ve been doing quite a bit of touring from the last album to this new one. The obligation to our record companies, Century Media and Sony Red, it was time to put together the next album. After three and ½ plus years of touring, we got together all our demos, ideas, riffs, and lyrics- and basically put them all together. Hired our producer that we used on the last album, Chris ‘Zeuss’ Harris, and he kind of took the whole hard drive that had twenty plus ideas and made sense of everything. In pre-production we did things like we did in the old days, the early 80’s without technology, but this time with technology. We basically built every song as a band, and collaborated. That being said, every song was very well thought out and it is spur of the moment creativity, on the spot enjoyment. When you are in a band and everybody is giving their A+ contributions to the songs, you never know how it’s going to end up. And that’s where the surprise is, it’s a good surprise. That for me is what a band should be- a collaboration of unique colors to create a mosaic of something that will make a fingerprint in all of our lives. We are very proud of this one, it definitely steps it up. 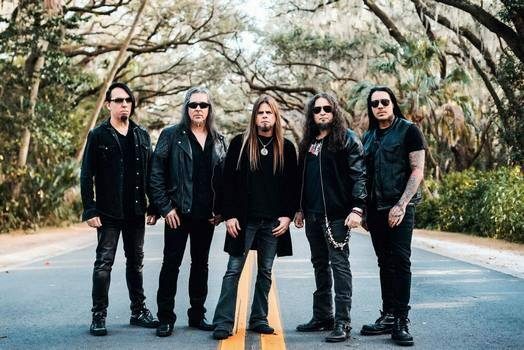 With this lineup, everybody is more comfortable, they’ve been consumed by this machine called Queensrÿche, they are writing within that and it’s really pleasing and it’s great to see that we are in a really good spot right now. I think it gets the guys very, very happy to see something that we’ve been sitting on for a little while but to see the reaction in the industry, this splash with The Verdict, it’s got us thinking about not waiting three to four years to release another record- let’s maybe do one sooner. We’ve already spoken to Zeuss and we are going to continue this process, I think it’s a good thing. I’ve been around for decades, I’m getting older, and I don’t want to wait around four years to make another record. Dead Rhetoric: Is it true some of these ideas reach back 10-15 years in the archives, as I read an interview that Todd did with Decibel magazine where he commented on that? Wilton: Right. There’s no rules, there’s nothing. It’s whatever fits the album. It could be riffs and themes that people have had on their hard drives. For example, the song “Inside Out” – that was an old riff of mine that never fit on an album until this time. It’s a powerful tune. A bit more esoteric, but a song derived from that riff decades ago. Dead Rhetoric: Todd also handled the drums on this release – how do you feel about his approach to the material, and where do you see the major differences in his style of play versus Scott Rockenfield? Wilton: When I told you that we had to write each song and think them out, the drums are included in that. When we found out Scott couldn’t be a part of this album, there was a moment of terror (laughs). We had a couple of options, and one of the options was Todd – you are a drummer, right? He obviously was a drummer before he was a vocalist, so he started drumming at 15. His influences, oddly enough, were Queensrÿche, Iron Maiden, and some heavier bands. His style, for him to build the parts with not much ego driven ideas. He would play for the song, and how with the drums he played in the song, it was huge on that point. People didn’t know, and I don’t think they would be able to tell the difference. It’s uncanny, he did such a great job. As we were building the songs, we got a midi-drum kit and put it into the ProTools. While we were writing the songs, Todd was writing the drum parts, the lyrics, and vocals. It was a lot riding on our shoulders, and in the heat of battle you rise to the occasion and it worked out. Dead Rhetoric: Is the door still open to Scott coming back into the band – or do you get the sense that his priorities have changed with the group? Wilton: You know- that’s just an open book. With respect to his privacy, I can’t speak for him. He’s doing something else right now, he’s gone down a different path. He’s not really interested in touring right now, he’s got some obligations. We totally respect that, and if he gets the itch- the door is open. I can’t really say anything else – after 35 years people change. Look- drumming is not easy, is it? It is a tax on the body. He’s a brother, a best friend and everything – it’s just a matter of when he comes knocking on the door again. This Queensrÿche machine has to keep going – if you are not going to be a part of it, it’s going to leave you behind. Dead Rhetoric: You are also one of many bands affected by the PledgeMusic fiasco going on where the public has pre-ordered your latest record, but the crowdfunding company has not been turning the collected money over to the bands to fulfill orders. What exactly went wrong in your eyes for this to happen after years of running smoothly? Wilton: Wow. They haven’t really disclosed many details, other than they robbed many bands accounts. I don’t know where the money went, and that’s not a good thing. It’s a contractual deal, and the money is supposed to flow into one account. It’s a UK-based company, and they are escrowing everything and they have obligations shipping the items. It’s a stop the world moment – for us, we had product and merchandise ordered, and the way we were going to pay for it is through the money in pledges. And now they have mysteriously disappeared- we are stuck with these orders, and fans expect us to pay for these orders twice (laughs). This is for all the bands that are on the PledgeMusic site- they bank what they are doing on the money that’s in the escrow, and now it’s gone. It leaves a salty taste in my mouth, a fraud kind of a thing. We are not really sure what they are going to do, if they are going to Chapter 11 it or be sold to another entity. It’s not good, it’s a mess and it instills a lack of confidence for people that support bands in crowdfunding. I highly doubt that some bands are ever going to do this again – and I highly doubt that we will. Dead Rhetoric: Throughout your career the lyrical content has been as important as the music for the band. Does it become difficult to tackle new subject matter or become inspired this deep into your career? Wilton: I think we tend to write about the experiences that are happening in our lives and how we absorb information, give our perspective on it. That’s just something we’ve always done – it’s thought out, relevant, whatever subject matter it is- whether it’s vampires, socio-political lyrics, war, or a crappy relationship. It’s something that is well thought out, we are not a band that writes about beer drinking, hot cars, and hot girls. We are more thought out and sometimes introspective – open-ended. What we are doing is more or less asking questions, asking why. We do it in such a way that’s artistic and fits within the song. Dead Rhetoric: The band has been in existence for over 37 years at this point – going through incredible peaks of sales and success, but also some turbulent times as far as other eras and band lineup shuffles. What do you consider some of the career highlights – and are there any specific changes you would make if you had the opportunity to do so? Wilton: As an artist, wow. It’s been such an amazing experience. I don’t think I would do anything different. I think all the records we’ve made, they were meant to be. I’m talking the 80’s and the 90’s. Those were big years, they were big years for the record companies, you had MTV as well. People were buying CD’s and records and cassettes, those were the big times for us. We won awards, we won the MTV award, we have been nominated for Grammies and performed at the Grammies, we just collided with popularity in the early 90’s, a brief moment in time where it was there. We were very busy, and we were a little progressive in our hard rock and metal. It was fun while it lasted. Then, a new herd of people come into the mix and they want their own thing. It changed, as you said the business side of it, yeah sure I would have done a lot of things different – but as far as the artistic side, it’s been a great ride. Wilton: We first and foremost know Queensrÿche are known as musicians- and there’s integrity in that. We’ve always been that, everybody within the band is on their A game – they are all great players and respect the music. It’s a balance of decades of what songs we want to represent. It’s great to see so many fans stick with us through the years. Their eyes light up when we play “Queen of the Reich” or “The Lady Wore Black” off the EP – I made that when I was 20 years old (laughs). And now the new music – on this The Verdict tour we are putting on a lot of new songs in the set, because the fans want to hear it mixed in with the older songs. It’s all part of the rebuilding process, and people believing in the band and supporting the band and wanting something different all the time. That’s something that we love, we love doing things that are different. Obviously we have some songs that you have to play, and if you don’t you get crucified for it. As long as we represent things as they were on the record, that made such a statement in people’s lives, that’s important because that’s how it’s remembered. It brings enjoyment to the fans. Dead Rhetoric: How does it feel to be seen as one of the premiere US acts when it comes to heavy, progressive-oriented metal – influencing future generations of musicians as far as your playing, phrasing, and songwriting output? Wilton: I’m not really aware of this, other than what I’m consumed of which is Queensrÿche. Obviously I’m thankful for influencing other artists and bands. In this business you don’t have much time to stop and take a look at what you’ve done. You are always in the now, and moving forward. The years have been kind, we hope that bands that are kind of unique like us can spur on and make careers with what they do kind of like we’ve been able to do. It’s an honor. Wilton: That song obviously was a song that hit so many people. Not just Queensrÿche fans, but casual Queensrÿche fans and even non-Queensrÿche fans. It had all the ingredients- it had MTV behind it, the video behind it, the record company behind it. I remember first and foremost when Chris (DeGarmo) played it for me on an acoustic guitar, we thought it could be a really cool song. And it just grew, we got Michael Kamen involved with the orchestration, we were just stretching the envelope. It was a great song that Chris wrote that just transcended the usual Queensrÿche fan, and he hit a home run. Dead Rhetoric: What are your thoughts on the metal scene today compared to say the 80’s and 90’s – are there specific advantages, disadvantages, or notable differences that make things easier or harder to sustain interest between the two periods? Wilton: I think the industry goes in cycles. Hard rock and metal music goes in cycles. When it goes underground, it doesn’t go away- people still love rock. I see it in commercials that have Motörhead songs. When I go to sporting events, what kind of music do I hear – rock music. It’s still everywhere, but it’s just not a popular thing. It still thrives, it still is successful, especially around the world. I think it’s always going to be there – people sometimes say that rock is dead, but it’s not going to die. It goes underground, it goes subversive, but I think it’s doing just fine. Dead Rhetoric: What can you tell the readers in regards to Whip Ale – how did you become involved and what do think about the ventures for musicians now align with a lot of different alcohol/food related deals? Wilton: I took advantage of a promotional item. I am not a seasoned connoisseur taster of beer, but I know what I like, and I made something that I like. It’s something I’ve done for a decade I think. It’s a lot of work – it’s contractual brewing, and obviously marketing and promotion are put into it. It’s a cut-throat business. It’s not an easy thing to make a living of it- it was more of a fun thing. If things ever calm down, I’m going to do another contract with another brewery somewhere. In Seattle, there are so many great micro-breweries, it’s stepping into the business for a brief moment. I have total respect to all of those breweries. It’s really great, you see trends. Pale ales are popular, and then lagers can be a thing. It goes in cycles. Dead Rhetoric: Outside of your interests in sports like golf, what other hobbies or activities do you like to pursue in your downtime to refuel and revitalize yourself to come back to your music and art fresh? Wilton: My life is consumed by traveling. I’m touring all the time. The few moments that I have to myself, I watch Netflix or I go gamble. I don’t have a lot of time, I’m consumed by Queensrÿche, and I think that’s a good thing. Dead Rhetoric: How does the band stay relevant given changing music tastes and the way people consume and process music these days? Wilton: I think we are relevant because we are a band that obviously has the legacy behind us, but we are moving forward. We record records that are relevant, and we are still part of the game. We still have a record company, we have marketing people, booking agents all over the world. We are in the situation of staying relevant- it’s a lot of work. Especially with the way the industry changes, you have to adapt to survive. We are dedicated to putting out new music and staying relevant, and touring our asses off. Dead Rhetoric: What is on the agenda for Queensrÿche over the next twelve to eighteen months? Are you already starting to piece together ideas for the follow-up effort – and would you ever consider developing a band documentary or write a memoir regarding your career? Wilton: A documentary would be a great thing to do, but that would be very time-consuming. It’s so many ups and downs, like you said in this career, the industry and how we fit into it- there are so many things that could be documented. That would be really amazing. You put out an album like this one- we are going to be able to tour off of this album for a couple of years. I know we are booked all of 2019 and they are booking shows in 2020 already. It’s kind of setting the stage for the band- we are going to have to make a concerted effort to get the songs together to make the next record.